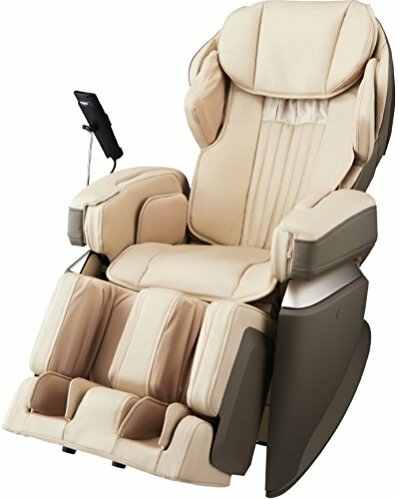 The Osaki-JP Premium 4S is a high-quality massage chair released in 2016 by Osaki Japan. 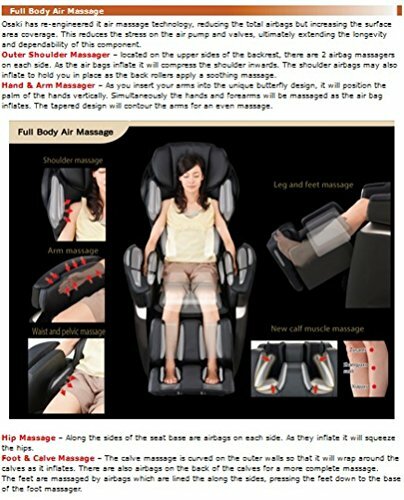 This electric massage chair features 4D technology, in addition to other innovative features. It’s an electric massage chair that hails from the brand’s premium line. TItan World LLC is the distributor of the Osaki-JP Premium 4S. Titan World is a reputable supplier of massage chairs, handheld massagers, back relief products, fitness machines, and foot massagers. Their goal is to offer total relaxation to the body for a better, more active lifestyle. The Osaki-JP Premium 4S has a 3-year warranty. The Osaki-Jp Premium 4S features an advanced 2 ball massage system that moves on a horizontal, vertical, and back and front plane. Before each session starts, its programming will map the your back and accurately analyze the contours of your spine and back muscles. 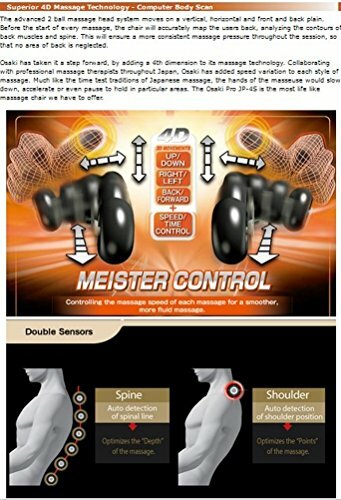 This ensures a more efficient and consistent massage pressure so that no back area gets neglected. Osaki has upped the massage game by introducing a “4th dimension”. By collaborating with professional massage therapists, its engineers have designed a system that adds variation and speed for every massage style. Similar to a true Japanese massage, the rollers will slow down, pause, hold or accelerate in certain areas, creating a lifelike experience. The Osaki-JP Premium 4S has a 2-ball roller head system which retracts and extends up to 5 inches. This helps in hitting areas that typical chairs can’t. For example: common areas where there is tension and stress build-up is the upper shoulder, back of the head, and the back of the neck. The Osaki-JP Premium 4S roller heads extend out to maximum length atop the shoulders then firmly press down while stretching the muscles. Osaki has re-engineered air massage technology to reduce the number of airbags while increasing the coverage of the surface area. This lessens the stress on the valves and air pump, which helps in extending the equipment’s longevity and dependability. 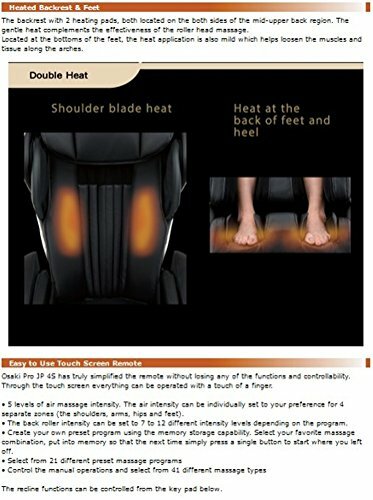 The Osaki-JP Premium 4S has an outer shoulder massager that is located on the backrest’s upper sides. Two airbag massagers are placed on each side. When they inflate, your shoulder will be compressed inwards. There are also shoulder airbags that may inflate to keep you in place while the back rollers work on a soothing massage. For many years now, Japan has been the by-word for high quality electronics and gadgets. When you buy from a really good Japanese brand, your product is sure to last a long time. Everyone who has experienced a full massage from this Osaki chair will tell you that the experience is excellent. The body scan works very well (unlike in lesser brands and models) and the superior engineering produces a truly relaxing and rejuvenating massage session. Osaki has been in the business of massage chairs for a long time now. The company is based in Texas and they do their customer support from there. Because of this, Osaki made it into our list of massage chair brands you can trust. With all the new budget chairs that are delivering very good performance, the Osaki JP Premium 4S seems really expensive. For veterans like us, we can see just why it has this price tag. It has excellent construction, assembly, and design. For budget shoppers though, this chair will not be an option. If you want a long L-track, then this is not it. We discussed some brands with the longest roller tracks in our Luraco Legend Review. Even with the chair coming out a couple of years ago, we can still say with confidence that the Osaki JP Premium 4S is still a very solid choice if you’re looking to buy a massage chair. We’d be happy if we got a chair exactly like this. The price point though is a big deterrent. Budget shoppers lean toward models from RelaxOn, a rising star in today’s massage chair landscape. However, while very popular right now (and maybe even dominating in recent sales), the jury is still out on these new breed of budget chairs. In the meantime, if you have the money to spend on an excellent product with a reputable company behind it, shortlist the Osaki JP Premium 4S. For sure, you’ll be getting extended value from your purchase. Massage Chair L Track or S Track?